We welcome you to our world. From time to time, we will offer you informative, entertaining and enlightening posts. We also welcome your points of view, so kindly take time to reply, reblog, tweet and post this blog post as you wish. 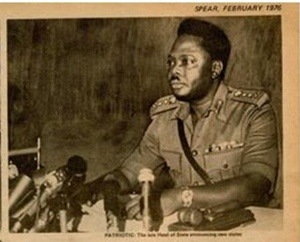 Thirty eight years ago this month, on February 13th to be precise, the beloved Nigerian military Head of State, General Murtala Muhammed, was assassinated in a coup. He was about 38 years old then. I was then in my senior years at Ibadan Boys High School, Ibadan. Like most Nigerians then, I received the news with utmost sadness. All activities in the school came to a halt. Our House Master then, a vibrant fresh university graduate, assembled all of us on the expansive school field to hold a vigil for the slain leader and the others killed along with him. If you were of age then, can you remember precisely what you were doing on that day and at that moment when you heard of the coup. Like it happened in the case of the late American President, John F. Kennedy, every grown-up American and many other citizens of the world who were socially aware then seem to remember with clarity, if they are asked, what they were doing on November 22nd,1963, at the precise moment they heard President Kennedy was dead. On that day of the assassination of Murtala Muhammed, Yours truly decided to comb every nook and cranny to dig up every bit of information on the life and times of the General and document it for posterity. 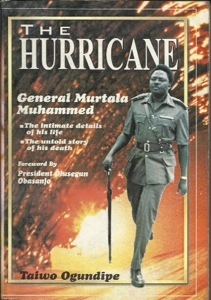 Thirteen years ago, an authoritative biography of the General authored by him was published by Topseal Communications Limited. The title of the book is The Hurricane. 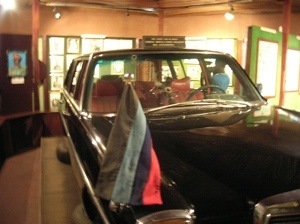 Former Head of State and ex-President Olusegun Obasanjo, who succeeded him, wrote the foreword to the book. This book is a good research work on the person of the late General Murtala Muhammed. It is a well outlined piece of writing on the life and times of the late Head of State who was indeed a personal friend and a professional colleague in the Nigerian Army. The Hurricane has effectively captured the historical perspectives of the work of the General, depicting his effort to bring about discipline and sanitization of the military and the Nigerian civil society. I Looked through the draft and concluded That you’re dead on course. In this book, Ogundipe captures the humanism, the urgency and the force of Murtala’s personality. His book is essentially different from an earlier effort in this direction namely Lamine Okion Ojigbo’s 200 Days To Eternity. In this book, written from an insider’s perspective, the author having served Murtala as an Assistant Senior Secretary, there is an attempt to offer a near-scholarly interpretation of Nigerian politics and Murtala’s place in that broad canvas. Ojigbo relies heavily on facts and hence he provides footnotes and references as he takes the reader through a clinical analysis of the Murtala Muhammed administration. Ojigbo and Ogundipe are nevertheless united in one respect, that is the respect with which they treat their subject: the kindness with which they approach him. But their approach is different. Whereas Ojigbo is factual and scholarly, whereas he concentrates more on the administration and its achievements, Ogundipe’s story is written from a human angle perspective. Both styles are, however, complementary. What Ogundipe has done really, is a humanistic interpretation of significant moments which defined the life and times of Murtala Muhammed as Nigeria’s leader. He concentrates heavily on the drama, on the events, the atmosphere, and in the process, he paints the picture of a betrayed hope, of a man who fell victim to the vaulting ambition of a few misguided elements. – Reuben Abati, The Guardian Newspaper. THE new book, The Hurricane, by Taiwo Ogundipe is yet another contribution to the existing debate on the question of the authentic Nigerian hero. Deploying tactics that are half fictive, half non-fictive, Ogundipe attempts to reenact the enigma of General Murtala Muhammed who ruled the nation for six memorable months only to be felled by assassin’s bullets on February 13, 1976. Facts of history are mixed with fiction to bring what can perhaps be described as the most spirited attempt so far to deconstruct the mind of the man. – Louis Odion, Thisday Newspaper. A revised version of The Hurricane will soon on released through Amazon. Watch out for it. Do you consider the late General Muhammed a hero? Let us have a feedback from you in the replies section.